Spalding is a household name when it comes to many sporting goods, and basketball hoops are no exception. Spalding offers a wide variety of both portable and in ground hoops for players from beginning to advanced. Today we are going to check out one of Spalding’s many portable basketball systems, the Spalding Pro Slam portable basketball system. The Pro Slam portable basketball system is a great option for your backyard or driveway, used for recreational games and practice. 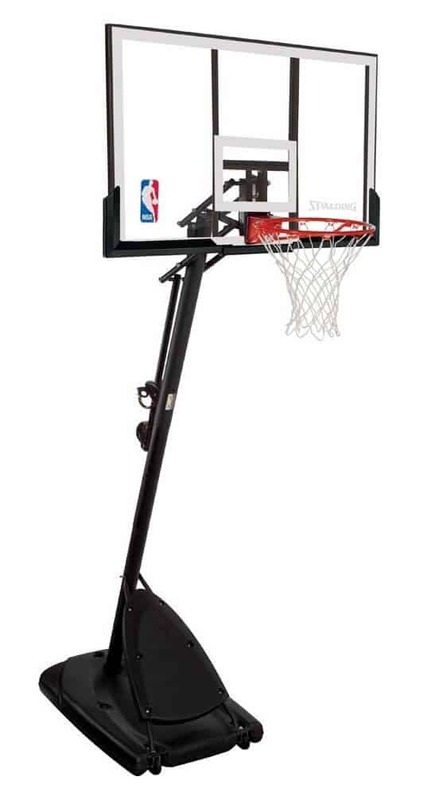 The Spalding Pro Slam portable basketball system comes in at a mid-range price point, so for those just starting their basketball hobby or those not wanting to spend many bucks, this is a solid choice. For starters, the Pro Sla system comes with a 54-inch acrylic backboard framed in steel for premium durability. Acrylic is a great choice for those who don’t want to spend the cash on tempered glass, but want more durability and quality than cheaper alternatives offer. The backboard also features a steel board pad. While this does offer greater strength of the backboard when going up for layups, this model does not have a padded board pad like some other hoops do, so take caution when going up hard for a layup or dunk, or purchase a padded board pad to add on to your hoop. Moving onward, the Pro Slam basketball hoop system takes its name from its key feature, the solid steel Pro Slam rim. This is a breakaway rim, allowing safe dunks for the young kids to the older players. The rim measures 5/8 of an inch, and comes with an all-weather net, allowing you to feel good leaving the hoop outside through different weather conditions without the net breaking down. With both the net and the pro slam rim, basketballers of all ages can bank on their bank shots, dunks, and layups bringing the heat for a long time. As for the lower parts of the hoop, the Pro Slam offers some various features, many quite comparable to other mid-priced hoops. It comes with a three piece angled pole that is 3.5 inches in diameter. The angling of the pole helps keep players from running into it during an intense game; however, the 3-piece aspect of the pole means that it has a higher probability of shaking and vibrating than higher end one piece poles do. Finally, it’s the base that really makes the foundation of any basketball hoop that is portable. With a solid base, you minimize shaking, falling, and other problems. The Pro Slam portable basketball system comes with a 34-gallon base that can be filled with sand or water for extra weight. Multiple reviewers commented that when filled with water, sand, or a combination of both, they felt the hoop was very sturdy and had no problem dunking on. When not filled, the base is easily moveable with included wheels. Overall, the Spalding Pro Slam hoop is a good choice in the mid to low priced category and as reviewers commented, not too bad to put together. Reviewers of the hoop stated the assembly time ranged from 2-4 hours on average, when doing it alone. Add in a helpful partner to aide you in putting the hoop together, and you’ll likely cut your time down even further. There were rare instances of missing defective parts, but overall this Spalding hoop comes packed as a quality product with the appropriate parts you need. The Spalding Pro Slam portable basketball system offers a fun, portable, and easy to assemble hoop that will provide hours of enjoyment and recreation for your driveway. From the youngest players just starting out to those who have played for years, this hoop and its features will be pleasing to all. And for a lower end price, your wallet won’t be hurting after such a purchase either. Spalding is a company that has been around for years and has proven itself to be a game player in the portable basketball hoop market.